3 MM and 4 MM steel hot dipped galvanized throughout, powder coated finish on panels. 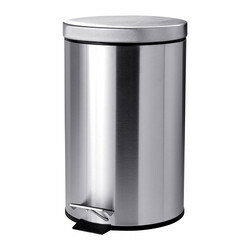 We are offering Uma-702 Rabbit Dustbin to our client. Regular Fix Lldpe Dustbin Rs 3,123/1PCS. The Waste Bin is a great accessory to any living space. Decorate it with Craftslane Decoupage Paper for that timeless look. The Waste Bin is hand crafted in eco-friendly, pine based MDF and is sealed and sanded to save you precious time. It is now available in a Flat Pack, making it even easier for you to work on! SMARTBIN is our flagship product and the worlds smartest waste bin with solar-powered waste compaction. Size: 5",10", 13", 17", 21"
We are offering Cane Dustbin.